Phones cheaper online with Omio.com? If you want to buy a phone and don’t want to bust the bank, consider British phone price comparison site Omio.com. It features special offers from end of the range clearance sales – like a giant online bargain bin, collecting offers from shops and sites around the UK. 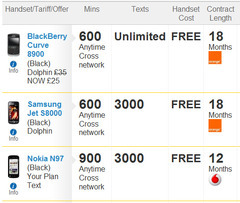 So on phones like the iPhone 3GS it has just got the standard O2 offers, but there’s a range of other good handsets with decent offers: Blackberry Curves with ten pounds off a monthly contract, for example. They recommend SIM-only deals as providing the best long-term value for customers. Omio reckon consumers can save up to 40% on handsets by buying online compared with the high street and flag up an example where the Nokia 5800 XpressMusic handset, which usually costs £48.95 on £25 per month tariff, could be had for free with a half-price tariff and more minutes. Obviously not every phone is going to be that reduced, but the site is worth a look before launching in on a big buy. Sorry Anna but perhaps its worth doing a bit more research in future before sticking up an article like this. There are plenty more websites out there which are more comprehensive in where they search compared to omio which have been around on the market longer like phoneslimited, rightmobilephone.co.uk and best-mobile-contracts. A simple search for mobile phone comparison would show that.